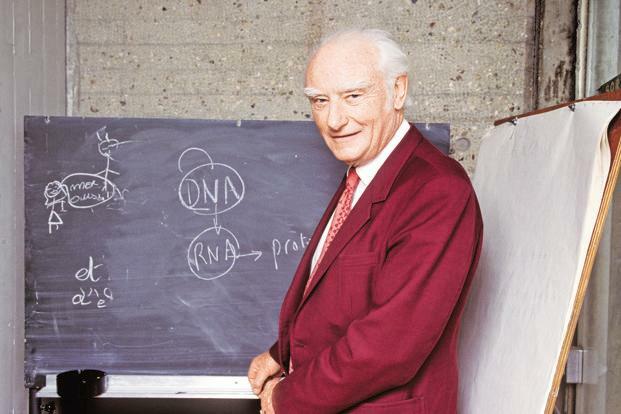 Francis Crick (8 June 1916 — 28 July 2004) was an English scientist who was most noted for being a co-discoverer of the structure of the DNA molecule in 1953 alongside James D. Watson. In his book published in 1982, Life Itself, he argues that there is no possible way that the DNA molecule could have gotten its start here on Earth and that it had to have come here from somewhere else. Within the mainstream scientific community, the generally accepted theory is that we are the result of a bunch of molecules accidentally bumping into each other, creating life. However, according to Francis, we are the result of what is now known as Directed Panspermia. Crick and a British chemist, Leslie Orgel, published their paper on it in July of 1973. As far as Crick’s thoughts on the theory that we are the result of accidentally bumping into each other, he thinks this was as likely as the assembly of a jumbo jet hit by a hurricane in a junk yard. In other words, he thought the theory held little to no credibility. When it comes to Crick’s theory, there have been some who expanded upon his work and have actually found evidence of it. Perhaps Crick had some evidence or he was able to connect some dots? After all, theories like this aren’t just born out of nowhere and this gentleman won the Nobel Prize for the study of DNA. Thoughts like this should not be taken lightly and evidence should be examined to see if it’s a plausible hypothesis. Please keep in mind while reading this article that, although we’ve discovered much, we have yet to identify the biological functions of large portions of our DNA. There is so much mystery wrapped in what could possibly hold the answer to life itself and the origins of the human race. A few years ago, Chandra Wickramasinghe, the Director of the Buckingham Centre for Astrobiology at the University of Buckingham in the U.K., published a paper regarding their supposed findings of the first-ever evidence of extraterrestrial life found in a celestial body. It’s interesting to think about, isn’t it? We are indeed, as Author Graham Hancock noted, like species with amnesia. We still don’t completely know where we came from and how we got here. What About The Fact That We Are Probably Not Alone & That We Are Probably Being Visited? The quote above comes Lord Admiral Hill-Norton, the former Chief of the Defence Staff and 5 star Admiral of the Royal Navy. That’s the highest possible rank of the British Royal Navy, similar to General Dwight Eisenhower’s 5 star rank in the United States. He was also Chairman of the NATO Military Committee. These are definitely positions to be ‘in the know’ about what is going on, at least to some extent. If you are unaware, there have been hundreds of witnesses carrying impressive backgrounds that have been in the position to ‘know’ about these things. To compliment this testimony, we also have evidence in the form of documents from several different government/military/intelligence agencies. Personally, when I think of all of the evidence that’s surfaced within the past few years alone, it’s mind-altering. If you’re interested, you will have to do your own research. If you don’t, next time somebody brings up the subject, it’s good to keep an open mind and at least acknowledge that yes, this is actually a strong possibility. I’ll leave you with this last clip from the Thrive documentary, of the late great Dr. Brian O’Leary, a former NASA astronaut, one of many astronauts who has spoken out enthusiastically about this subject and the evidence behind it. My apologies if you’ve already seen it, as I’ve used it numerous times in previous articles.